Chosen and edited by Alexandra Shelley for Bridge Works. "This provocative morality play, Lane's second novel (after Static), is a scathing indictment of the military justice system and the cover-your-rear attitude of the U.S. Navy. 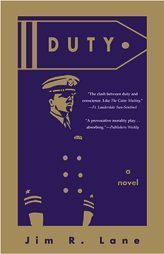 Petty Officer Marion Lamm, a 12-year Navy veteran and respected sailor aboard the fleet tug Modoc, based in San Diego, is falsely accused of homosexuality by a druggie shipmate. The ship's captain, an irrational martinet and rabid homophobe, demands that Lamm be court-martialed, ordering the legal officer, Lt.Mark Palmer, to gather enough evidence to ensure a conviction. Palmer is a hapless but ambitious officer with 16 years in the service and, though he knows the case is a sham, he's too frightened to cross the captain. The mysterious disappearance at sea of Lamm's accuser complicates the case, but the captain bullies Palmer to carry on. While Palmer investigates, he begins to have private doubts about his own sexuality, realizing how difficult it is to categorize and certify desire. Other servicemen are disgusted with the blatant injustice they observe, but conflicted Palmer persists in selling out his conscience and honor, with predictable results. Palmer's last-minute change of heart and a confrontation with his captain saves neither Lamm nor himself, and the Navy's attitude that "the appearance of justice is as important as justice itself" prevails. Earnestly lacing his story with stinging critical commentary about the military's hypocrisy regarding homosexuality and sexual harassment, Lane candidly depicts rigid career officers and near-illiterate, bigoted and slovenly enlisted men, and Palmer's fainthearted complicity humanizes the book's central moral crisis. Through the character of the conflicted Palmer, Lane emphasizes both the corrupt methods and the demoralizing effects of coercive politics in military life, and his absorbing narrative is a call to action."